You’ve been on many cruises before and think you have mastered packing. So did we! But, deciding what to pack for an Alaskan cruise is altogether different than what you would typically pack for a Caribbean cruise. 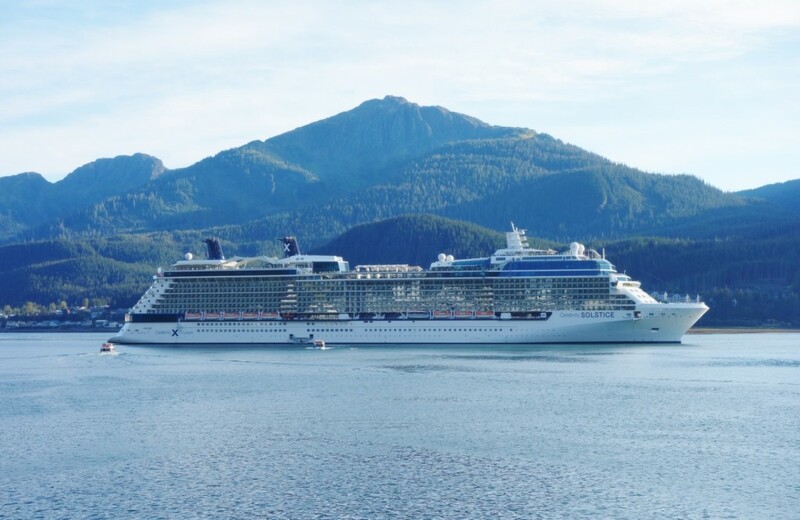 For our September 2014 Celebrity Solstice cruise to Alaska, we didn’t know where to begin when it came to packing. Of course, we scoured the internet and message boards for advice, but a million different people give a million different opinions. So, we took all the advice into consideration and came up with our own What to Pack for an Alaskan Cruise guide. Admittedly, we do tend to be over-packers, but hopefully this list will help you figure out your essential items and condense your packing list to reduce extra luggage fees from your airline. Keep in mind that the Alaskan cruise season runs from May to September with variations in temperature and precipitation. Our September cruise was at the end of the travel season so may have been a bit cooler than if you traveled during the peak times of July and August. Although, we did have an unseasonably warm and dry week. 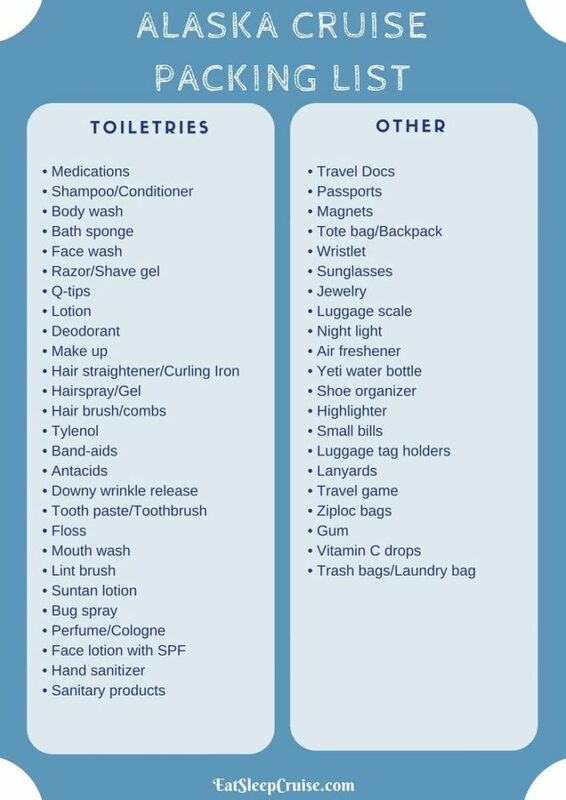 Depending on your travel preferences, you may not wish to bring along as many toiletries as we do, so feel free to pick and choose from this list as desired. If you are okay with the provided soaps and shampoos, then that can save you some space (and weight) in your luggage. Do be sure to bring all medications, both over the counter and prescribed. Even though you are visiting Alaska, you will still want to pack suntan lotion and sunglasses as the sun reflecting off the snow and ice can be quite strong. We also recommend Downy wrinkle release to help keep your clothes as wrinkle-free as possible as irons and steamers are NOT allowed on cruise ships. You can also never have enough hand sanitizer! Note: you will not need a hairdryer as one will be available in your cabin. Besides the necessary travel docs and passports, we have accumulated a list over the years of “other” items that we find essential for a cruise to any destination. Many of these products can be purchased fairly inexpensively on Amazon or at your local Target or Walmart. Magnets come in handy for hanging hats, bags, jackets, and other items in your cruise cabin (We use 40 lb. ones). A luggage scale will ensure you are not over your airlines weight limit on the return trip home. A Yeti water bottle will help to keep a cold drink cold or a hot drink hot for hours. This will definitely be useful to keep your coffee or hot chocolate warm on those early Alaskan mornings. We use an over the door shoe organizer, not for shoes, but rather to store toiletries and other small items to free up counter space in the cruise cabin. Cruise luggage tags are great items to protect those paper cruise tags on your suitcases, as lanyards are equally as important to store and carry your room key card. Ziploc bags are great for spill-proofing or water protection, while trash bags are handy to store dirty laundry over the course of the week. When we pack, we typically pick separate outfits for daytime and nighttime regardless of travel destination. For a typical 7-day cruise with a pre-cruise stay, we plan 8 daytime and 8 nighttime outfits, including undergarments. Of course, you will want to consider items that can be re-purposed for a couple uses during your trip. When packing for Alaska, you want to remember LAYERS! You will want to be prepared for temperatures that fluctuate as much as 30 degrees (F) in a given day. For daytime outfits, it wouldn’t hurt to pack a pair of capris or shorts for the unseasonably warm day or for lounging around the ship, but you will want mostly jeans or other weatherproof pants. For shirts, you will want a combination of short sleeve and long sleeve, perhaps some thermal or moisture-wicking. You will also want some kind of sweater or sweatshirt or fleece jacket to layer over these shirts if needed. In terms of outerwear, a packable raincoat and 3-in-1 coat are essential. We only used our gloves and earmuffs/hats for one morning of our cruise, but we would definitely recommend still packing a pair. For nighttime outfits, you will want to pack business casual type outfits. Think khakis and collared shirts for men and dress pants, dressy jeans, or casual dresses for woman. Alaskan cruises are more casual overall, but many cruise lines do still have “formal” or “evening chic” nights where you can feel fancy if you choose. We like to participate, so we always pack 2 formal dresses with heels and a suit with 2 dress shirt/tie combinations. Women may also want to consider a cardigan or pashmina as it can be a bit cool at night even on the ship. Our footwear collection was a bit more extensive when packing for an Alaskan cruise versus a Caribbean cruise. When it comes to footwear, you will want casual shoes for daytime use and dressier shoes for nighttime use. For daytime use, you will definitely want a pair of sneakers, another pair of comfortable walking shoes (we love Sperry’s), and waterproof shoes or boots as it WILL rain during your trip. Some options include Sperry duck boots, Merrell hiking shoes, or Hunter rain boots. I did pack a pair of Ugg boots, but they were not really necessary. Of note, we did not use our bathing suits but that does not mean that you shouldn’t pack yours. There are hot tubs and indoor pools onboard the ship. Admittedly, we pack much more in this category than most cruisers. So, our suggestion is to pick and choose your essential devices whether they be cellphones, laptops, tablets, or cameras. Once you decide which gadgets you plan to take, you will find one of these cord organizers very helpful to keep all the chargers in one convenient location. Speaking of all these electronics, a mobile power charger is essential as outlets are very limited in cruise cabins. You might also want to consider a portable power pack to keep your devices charged when going ashore. In Alaska, binoculars are also a great accessory. Packing for a vacation shouldn’t be stressful. So, feel free to print up a copy and use this as a check list while packing for your Alaskan Cruise. We have learned from our past packing mistakes and won’t over-pack (as much) during our next trip to Alaska this summer on the new Norwegian Bliss. Happy Travels, way up north to Alaska! Have you traveled to Alaska? Are there any items on your packing list that we have forgotten? Let us know what items you think are essential to help fellow cruisers pack for their Alaskan Cruise. Great packing suggestions! Hopefully someday we can take an Alaskan cruise and will keep this packing list handy! It’s a ridiculous packing list. You can easily take one third of what is listed and be perfectly acceptable. Who the hey packs 16 pairs of underwear? Trust me, not even astronauts going to Space Station. Pack no more than 4 and wash them with regular soap every day when you shower – dry them in the closet on a hanger if you are shy about leaving them in the bathroom to dry. Who packs 2 pairs of gloves for each person??? CRAZY. If you live in cold weather, you’d know only one pair is perfectly fine. 3 pajamas? WHY? 11 pairs of shoes? DUMB. Rick Steves would kick her out of his tour group. Seriously, don’t follow this list. It’s ridiculous. I was tempted to disagree with you Mayra until I read that they packed 4 suitcases with 170 lbs of luggage. That seems a little excessive for a party of two. We will be sailing to Alaska in a week and plan on taking one larger suitcase for our two children and two carry ons for me and DH. Three suitcases total. Doesn’t leave a lot of room for all those shows that’s for sure! REALLY! i THINK YOUR “CUT AND DRIED” COMMENTS WENT ACROSS THE METER BOARD TO RUDE AND PREACHY. THIS ARTICLE WAS MEANT TO ASSIST AND INSPIRE, EVERYONE CAN TAKE ANY OF IT OR NOT, NO NEED TO SET THE ANGRY TONE. I have never been on a cruise much less one to Alaska! Those are good recommendations to take and what you will not need. Might as well save some of that overweight luggage fee to spend on stiff to bring home as gifts or mementos. We are going to on our Alaska cruise in 3 days, can’t wait. I’ve packed close to your list. We’ll see how it goes!!! I would love to go on an Alaskan cruise, I bet it would be so beautiful to see the landscapes of Alaska from both ship and land. Thank you for the packing suggestions. This is a great post. I went on an Alaskan cruise last year, and it was great. You really do need to pack accordingly when you head to a place like Alaska. I’d love to do one of these some day. I’ll have to take your advice when it comes to packing because I’ve never gone on a cruise like that! Thanks for this detailed list! I’m not sure I ever want to go on a cruise though I would love to go on a European river cruise. Alaska is one of my favorite places to cruise to! This is very similar to our list when we cruise to Alaska. Alaska is on my list of places to see. Thank you for this awesome and detailed packing list! Great list! I have been wanting to go to Alaska, maybe on a cruise. Thanks for the guide! This list will be so handy for many! Planning on going on a cruise, will definitely use this. Thanks for a great post. Now this is definitely some awesome advice for a cruise – will make use of it once we do have one. I have never been on a cruise but I have always wanted to go so badly. 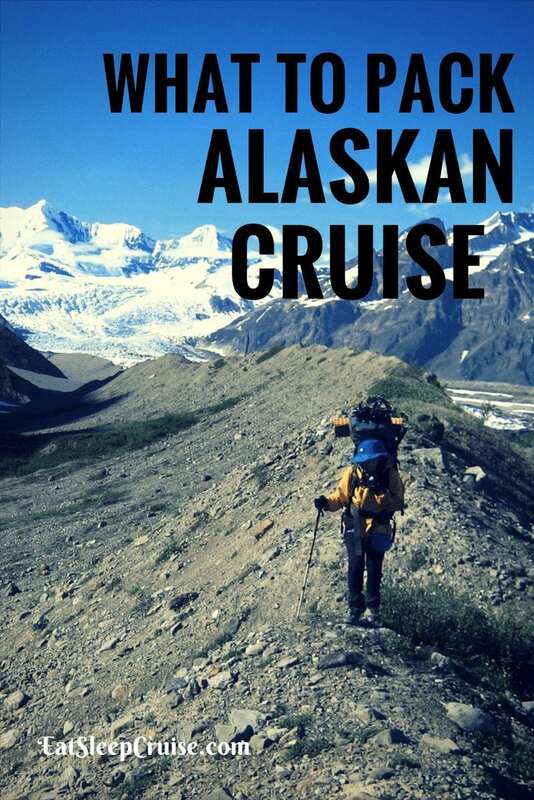 An Alaskan cruise sounds like so much fun and you sound like you have everything set for your trip! Such a great packing list! I don’t know that I’ll be taking a cruise to Alaska anytime soon, but I really love these suggestions as a reference! What a nice idea to write out your packing list. I’m so bad at over packing. Maybe if I made a list like this and noted what I didn’t use I would stop taking too much stuff on my trips. Alaska, how cool to travel there! I’ve never been, but thanks for the tips! In case I do go, I’d be very well prepared. GLad you found the post useful Pickett Family. Definitely get out there and explore Alaska. It is a great family vacation, especially when you travel by cruise ship. Appreciate the comment. Thanks for reading. All I can tell you for an Alaskan trip is have a great time. I’m staying here where its warmer. Much warmer! I’m definitely not a person for cold temperatures. brrrrrrrrrrrrr just thinking about it makes me shiver! LOL Dolly. Alaska is certainly a beautiful place to visit, but honestly it is not too cold when you travel in the summer. We got lucky with some great weather, so it was unseasonable warm. Thanks for the comment! which did you wear more your uggs or your hunter boots? I am going on this cruise in august. I excited and want to start shopping around for what i need! Thanks Claire for the comment. The wife only wore the uggs one day, during our glacier excursion, and those were not necessary as the tour company provide adequate footwear. Pack the hunter boots! Those were essential given the rainy weather. You can always pack some sock liners in case it is cold. Have a great cruise! regarding pants – would running pants/leggings (nylon/polyester) be better than jeans? Concerned about jeans taking so long to dry & I was afraid I couldn’t get as many wears out of them. thank you for putting together such a helpful list! HI Cindy. Sorry for missing this message. We packed Jeans as well as some hiking pants which came in handy. These were lightweight, nylon material that are “weather proof”. You can get them at LL Bean or other outdoors stores. Those really came in handy. My husband also wore some more traditional snow pants for the glacier tour, but it really wasn’t necessary. We suggest both a pair of jeans and a pair of versatile all weather pants. Thanks for reading and appreciate the kind words about the list. We can’t wait to get back to Alaska! Soooo glad I found this post. I can’t wait for my trip to Alaska! Thanks Carol for the comment. We are glad you found the list too! When do you sail to Alaska? If you have any questions, just let us know. Have a great trip! Thanks Carol for the comment. We are glad you found the list too! When do you sail to Alaska? We can’t wait to get back there as it is an amazing place to visit. Happy Cruising. Hi Megan, glad this list was helpful. We would love to hear about the cruise once you get back! Awesome list! We are headed to Alaska in 3 1/2 weeks for the first time ever! So excited! 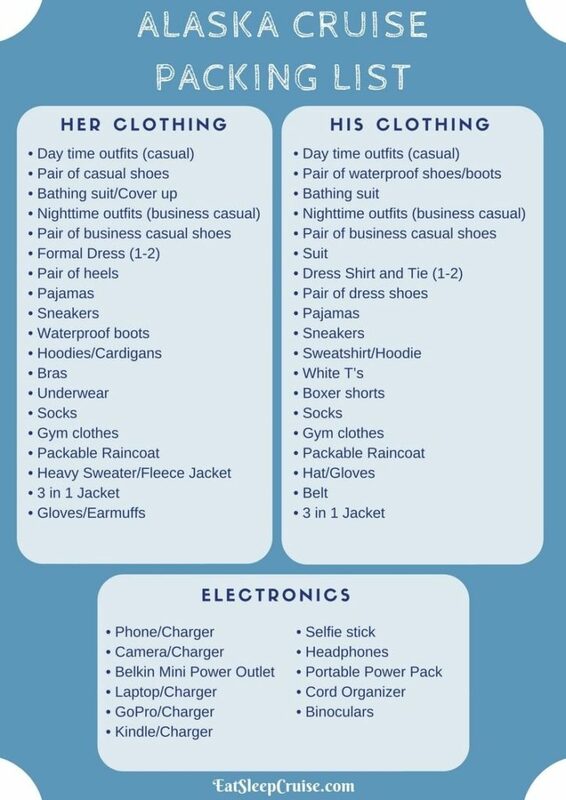 I’ve copied this list to help with our packing! Thanks for all the details! Hi Tricia, thanks for the comment. Glad you found the list useful. We are all about the details! We are a bit crazy. Would love to hear about your cruise. Which ship are you sailing on? We are going on an Alaska cruise next week, so this list is very welcome. I’ve been on Caribbean cruises, so packing for Alaska will be different in terms of clothing but the cruise “essentials” are about the same. HI Amanda. Congrats to you and your husband. An Alaskan cruise is a great honeymoon. We would love to hear how your list compares to ours. Appreciate you reading the post and leaving a comment. Have a great cruise! Nice list! Would be helpful to know how long your cruise was – or did I miss that? Hi LJ, thanks for the comment. Glad you found the list useful. We did a seven night Alaskan cruise, departing from Seattle. We did a pre-cruise stay the night before, so a total of 8 nights. When is your Alaskan cruise. Appreciate you reading the post. This was most helpful. Some sites list the basics but not the quantities. I especially like the recommendation for the Belkin outlet…great find. We go in september and we tend to pack a lot. I’d rather not have to do laundry during our cruise. Also we will be going on to Vancouver and Victoria afterwards so will need clothes for that too. Hi Gina, Thanks for reading and the comment. We go a bit overboard when it comes to packing for our cruise. Good idea about adding a flash light-we actually just started bring a batter operated nightlite and a compact room freshener. We did not find the ship to be cold. We packed night time clothes we normally wear on a Caribbean cruise and found the temperature onboard to be just right. The wife did bring two light cardigans to wear in case she needed them, but she never broke them out. Happy cruising. We are heading to Alaska on the Solstice this Friday and am using your list. I always overpack so its great to have a guide. I also sent it to my son who is meeting us in Seattle and he tends to do everything last minute so I hope it helps him to remember things without his mom harassing him. Did you wear your 3 in 1 coat on the ship or was it mainly for the excursions? Thanks! Thank you for posting your list as a guideline. We are gong to Alaska next May on the Solstice. We are going on the 9-day with a 3-day stay afterward in Seattle. I have read to pack and dress in layers, so I am working on my list already. How dress were the formal nights? What did you like best about the Solstice? I have never been on a cruise before, nor been to Alaska. Also, did you do some of the excursions? I’m not really into “touristy” things so much, but do want to go whale watching. Thanks so much for your list. Do you consider formal for women a long dress or cocktail dress? and did you find heels a pain with all the walking on the ship? Do you have temperature control in your room? I did not see robes listed. Do you need layers while on the ship or just excursions? I like a nice sweater or shrug with a cocktail dress but I don’t want to be sweltering at the dinner table or at a show! I am a notorious overpacker. and can’t wait til our cruise in September! I’m concerned about temperature control especially in my room as I like it cold. It’s extremely convenient and I’m not going until next September of 2017. In the meantime, I am reading everything I get my hands on! Thank you so much. You were rude in your comments. Typing in all capital letters is equivalent to screaming.